How important is it to be organized? Lack of organization can make us long-term slaves to our own mess. Organization is the most persistent of challenges. People can spend years digging themselves out of a disorganized life. A messy house can inhibit your ability to entertain guests, affect your self-esteem, create increased stress, degrade relationships, cause headaches at work, and make it nearly impossible to locate important items. A nicely organized house can be as pleasant to live in as a disorganized house costing twice as much. With so much to do every day, we can often feel constantly unable to catch up or keep up. Your ability to be organized will greatly affect whether or not you feel in control over your life and your surroundings and are able to participate effectively in things that interest you. Being disorganized at work can cause increased stress at home, and being disorganized at home can cause increased stress at work. The more things you have and keep, the more things you must organize. Since organizing requires constant work, a simpler life is often an easier life. Remember that each item that you keep will likely be organized many times during your future. It will take daily effort and thought for many weeks, but these steps should allow you to eventually get your life back. Take pride in each small accomplishment. Getting organized can be a long journey. It is important to first set up a system for organizing. Don't worry if your house is a mess, create your system first. Once your system is in place you can begin to unscramble your life. If you don't have a system, then everything that comes into your house will end up in a random drawer, on a table top, on the floor, or in a "messy room". When you add papers, work emails, home emails, computer files, digital pictures, to-do items, receipts, advertisements, clothes, most of us have over 10000 items in our life that need to be organized. The best approach is to reduce this 10000 items into about 20 groups and then use this very same 20 groups for boxes, folders on your computer's hard disk, your smartphone contacts groups, notes that you put into your notepad app, and your email (Outlook) folders. Each of these 20 groups will be described in more detail later. Strategic use of technology can definitely make managing life easier. Go Paperless. Store things digitally rather than using paper. See sections below for how to organize your smartphone and computer. Make SURE to have backups. ALL digital devices can fail, break, or be dropped. The quickest way to organize is to put things where you would expect to find them. This strategy works very well for people who struggle with things getting lost. Put Everything in its Place Now! Don't delay! Once your organizational system is in place, it is important to "live within your system" at work and at home. Organizing is something that needs to be done persistently and continuously as you go through your regular day. During the normal day, you will think of several ideas for how to better organize your things. Be sure to take action on these ideas immediately before these ideas are forgotten. Good ideas are so easy to forget. Sparks of organizational insight are ideas worth remembering. If you cannot take immediate action, then keep a list. To put everything in its correct place, think about the following question anytime you look at any item in your house: "If each item has a purpose, is each item located where it should be to serve that purpose." Try to avoid creating "miscellaneous" piles. Once you have established your system for organizing, put things into that system and not into "miscellaneous" piles. If a strategy doesn't seem to be working, don't be afraid to re-think or change it. You cannot really know what you have, unless it is organized. We are all creatures of habit. The secret of success is simply creating good habits. What to Keep and What to Throw Away? Remember that you typically use only a fraction (< 20 %) of the things that you actually have. Many of our possessions are simply museum pieces to our existence. Throwing everything in drawers is a poor solution as items in there will remain permanently lost for decades and the drawer will not be used effectively. People often have "locational blindness" and allow certain areas to always be a mess. Take each item and move it to a different location. Then your mind will be forced to re-evaluate each item based on its actual significance rather than by "it's always been there". To determine if an item in your house is valuable, ask yourself (1) when was the last time you used that item, and (2) when is the next time you will use that item. Any date on an item (expiration, copyright, edition, sales effective dates, offer ends by, ...) can be very helpful in determining if it is obsolete. Separate what you want to keep from what you want to get rid of. Move what you want to keep into your organized locations discussed on this web page (including boxes, computer folders, and phone contacts). Move things you no longer need to a recycle bin, charitable donation, giveaway to a family member, or trash. Don't let advertisers fill your house with their advertising. Take back your house. Sort your mail by sender and count the frequency of advertisements from various sources. You will be shocked to see that some companies are mailing you advertisements every single week. Set things down in the correct place. Finish each task in an organized manner. An obvious point that should not be overlooked.... If you have too much stuff in one room and inadequate storage or inadequate closet space, then the room will be a mess. Go through your books, clothes, magazines, and mail and RE-EVALUATE if they are still things that you use, or should they be given away or recycled. When it comes to clutter, we are our own worst enemy. Clutter is the usually the result of deferred decisions and deferred tasks. Understand the reasons why we set things down in the wrong place: (1) We intend to move it where it should be later, (2) We have no designated place for the item, (3) We do so intentially so we won't have to remember the item's new location, (4) We do so intentionally so the item will serve as a "to-do" reminder. Clutter can make entire rooms unusable and even unpassable. Clutter can make cleaning, dusting, and vacuuming difficult, which can lead to an increase in dust, dust mites, and household allergins. Conquering clutter requires persistent effort. Whenever you realize that something is out of place, move the item to where it should be. The split second that you realize that an item or piece of paper is unneeded, immediately move it to a recycle bin. Is this item being used for its intended purpose? If not, where should this item be located to be useful for its intended purpose? We you see clutter, from now on call it "uncategorized items". Why? Because this simple renaming, "teaches" your mind what needs to be done. Relish in the peace of mind that comes from having an uncluttered room. Check the list of acceptable items for your curbside recycling program and make sure you are putting everything possible into your recycle bin. Recycle old electronics ( old, broken, smaller TV's, stereos, dvd players, speakers, etc...) at most Best Buy stores. Donate clothes and other items you no longer need or want (See Charities and Donatable items and Tax Deductions). Try everything on, and donate all clothes that you don't wear, don't fit you, or don't match your style. Donate any pants that are so tight that they hurt your stomach or don't allow you to tuck in your shirt. Garage Sales and Yard Sales can help to get rid of unwanted items that still have value. Books you no longer need can be donated to your local Library. The tax deduction you can claim for the donation will often be more than the amount you will earn by selling them. Computer and travel books older than 7 years should be discarded. Keeping usused books and other unused heavy items makes no sense. You will just end up hurting your back trying to move them in the future. If items are never used or touched, then they are either obsolete or they are in the wrong place or they should be given to someone else. Dust on items and clothes is a good indicator that they are never used. It is better that items be used than just sit in a pile at the back of your closet. Some less fortunate family may be very happy to receive donated clothes or other items that you no longer need should be washed and given to a charity. Famous organizer Marie Kondo recommends that we determine which items we keep on the basis of whether those items truly give us a spark of joy. Is each Item in a Temporary or Permanent Place? Clutter tends to be items in "temporary" places. Think of moving items in "temporary" places to their "permanent" place. See boxes and rooms for good ideas of "permanent" places for your things. The reason we keep any piece of paper is for the information that is on it. If that information would be more helpful, accessible, or usable in another place (such as in your cell phone, computer, tablet, or flash drive) then transfer the information and recycle the paper. Information is only helpful if we can access it when and where we need it. Paper clutter also tends to be caused by a reluctance or lack of time to read these items and determine if they are important or not. By reading more of these items, you will be able to determine where to put them or if they should be recycled or discarded. Shop and purchase very carefully and make sure that anything that you buy is EXACTLY what you want and need. Avoid or cancel subscriptions to periodicals that you don't read. Unsubscribe from postal mailing lists that are not helpful to you. Try not to surrender your home address on those $1000-chance-to-win giveaways, these are marketing traps. Stand over a recycle bin as you process your mail and discard unwanted items immediately. IT'S ALL CONNECTED. Your personal life, work life, parenting life, and ALL of your responsibilities can ALL have a direct impact on your ability to stay organized. Americans working full time work on average 47 hours per week, causing considerable stress and making it very difficult to stay organized. Usually organizational problems and messes tend to build up everywhere (house, garage, basement, car, office, ...) simultaneously. Being organized requires good time management; both having time and making time for organizing. Use good planning and your smartphone GPS to make your trips and errands as efficient as possible. Think ahead and take care of as many items as possible on each errand or outing. Since most outings begin and end at home, think in terms of "efficient circles" and try to accomplish as much as possible in each circular trip. Forgetting things that we need and being late adds a lot of unnecesssary stress to our life that we can avoid by doing a better job at planning. Immediately put things where they will be needed in the future. For example, if you know that you will need to take something in the car tomorrow, put it in the car now so you won't forget. Always bring things to do during idle times such as anytime that you are waiting before appts. Avoid giving away your email address and getting on unnecessary email lists. Convert all of your bills to Auto-pay. Write "paid" (and include confirmation numbers if available) on any paper bills that you pay, so you won't forget that they are already paid. By wrinkle-free clothes so you don't have to spend time ironing. Cook in advance and cook larger quantities, so you don't have to spend as much time cooking. Be strategic and use good planning and sensible ordering of activities as you do your normal chores such as cooking, cleaning clothes, cleaning dishes, house cleaning, grocery shopping, yard work, and showering as these tasks will often consume a majority of your available time. Bring our mail in from the mailbox in a timely manner, so you can be aware of and take advantage of specials. Many sales only last a couple of days. Put coupons that you plan to use in a ziplock bag (transparent on both sides) and gift cards in a small ziplock bag. Keep these ziplock bags in your purse or car, so they will be kept together and so you will have them with you when you need them. Include a fresnel lens in your ziplock coupon bag so you can use it to read expiration dates. Keep Mailer Coupons together with binder clips so you can toss groups of them as they expire rather than one at a time. Recycle all expired and unwanted coupons. It is important to put all expired coupons and outdated flyers and newspapers in the recycle bin, because these will obscure your view of current coupons. Recognize the peace of mind and self-confidence that comes from having open, attractive, uncluttered, and spacious rooms within your house. Try to "widen the room" when you clean. We often clean the high traffic paths within a room, but ignore other the rest of the room. This leads to rooms with "paths" through the middle of them and clutter everwhere else. So everytime you clean, try to "widen the room" and clean all the way to the walls of each room. To dramatically reduce millions of dust mites and indoor allergins in your living spaces, make sure that clutter does not inhibit you from cleaning and vacuuming the ENTIRE room. Try to "widen your countertops" as well. We often clean only the parts of the countertop and sink top that we use. Try to create a bigger and more "luxurious" countertop by simply cleaning all the way to the wall or edge. Use the SAME groupings for your smartphone contacts groups as you use for your office room boxes. Family Create contacts for all family members and relatives (all of them) (Add children names, pet names, and best time(s) to call in the notes field.). For deceased family members start contact name with "Deceased" and enter the address and phone of the cemetery where they are buried. local Motor Vehicle Dept (for annual property tax). Emergency Road Service phone number (often included with your auto insurance policy or from AAA). In the Comment field of each doctor, dentist, and vision doctor, enter the past appointment dates (see also your health.doc) for each family member so you can keep track of length of time since the last appointment. In your vision doctor's comment field, enter your eye glasses prescription information. Your Health Savings Account provider. Your homeowners association treasurer (dues), activities coordinator, and project approver contact information. Your landlord or Apartment Rental Office contact information. Travel (Have one main Travel group. You will be able to contact anyone with just a couple of keystrokes. Most smartphones allow you to simply type any contact name into the numeric keypad. For example, to call "John" you would type 5(J), 6(o), 4(h), 6(n). You will be able to GPS navigate to any location from any location using just a couple of keystrokes. All incoming and outgoing numbers will be recognized by your phone and will no longer be just numbers. You will be able to screen your calls effectively. Try to include enough information in your contacts that you will be able to properly fill out information forms for each family member such as those required by doctors and dentists offices. Add email addresses for all of your contacts. Many smartphones allow you to send a text message to an email address. For places in your contacts list that you visit often (stores, banks, libraries, hair salons, ...), add the business' hours of operation in the Comments field. Be sure to backup your cell phone contact list and cell phone calendar to your phone's SD card and to remote storage (usually your Gmail account) so you won't lose your contacts if your phone breaks or needs to be replaced. Be sure to backup your cell phone pictures to external backup such as your computer, Google Photos App Cloud, or Apple ICloud so you won't lose your pictures if your phone breaks or your SD card fails. SD cards DO fail. Where useful, add website and/or facebook page to each contact and set your phone to remember your account number and password so you can log on quickly. Stay connected! Add wireless network names and passwords to the notes field of your phone contacts list for each wireless hot-spot location that you commonly visit. Add one of the many free "Notepad" app's to your cell phone, so you can always take notes and keep track of the things you need to remember. Career Your career to-do list. Fun Your "Fun" to-do list. Gifts Your gift ideas for yourself and each family member. Beside each person's name, in addition to gift ideas, you can also their clothing sizes. Health Your health to-do list. House Your house to-do list. Investing Your investing to-do list. Today Your to-do list for today. Travel Your travel to-do list. Work Your work or professional to-do list. (your hobby) Your Personal Business or Hobby to-do items. Bucket List Your personal lifetime bucket list to-do items. Lent out List of stuff you've loaned out, so you can remember to get it back. Many smartphones have voice-to-memo features that allow you to simply talk into your phone to save things you want to remember. Use the camera feature on your cell phone to take note of and quickly capture things that you need to remember. A big part of success is being able to successfully capture and make use of the hundreds of good ideas that pop into our heads. Whenever possible try to simply take immediate action and GET THINGS DONE rather than adding each item to a to-do list. Efficient time management is crucial to staying organized and is the only way we will have time to organize. Lack of organization can cause you to miss important appointments or interesting events. Your ability to manage your schedule can determine your personal and professional success as well as the amount of stress in your life. Skillful use of technology (esp. your smartphone) can make it possible to successfully manage the activities within your life. On your cell phone, create a bookmark and shortcut to your child's school's web site, so you can access the school calendar anytime. Especially if you are in the Kansas City area, I would recommend you add a bookmark and shortcut to www.superdancing.com to your cell phone. Add access to your each of your home or personal email accounts to your cell phone so you can send and receive home email anytime. Usually a free app is available for each email type (e.g. Gmail). After installing any app, be sure to go to your Settings > Application Manager, locate the app you installed, and adjust or disable the notifications from that app according to your preferences. Make sure you only allow an app to send notifications to your cell phone that you need and disable ALL others. I do not recommend allowing an app to send email notifications. To get started, you will a variety of large and medium binder clips and about 20 boxes on which you will put the following labels: Cameras, Car, Career, Computer, Coupons, Games, Gifts, Health, House, Investments, Keepsake, Manuals, Money, Office Supply, Phone, Pictures, School, Taxes, and Travel. Each of these will be discussed further in the following sections. 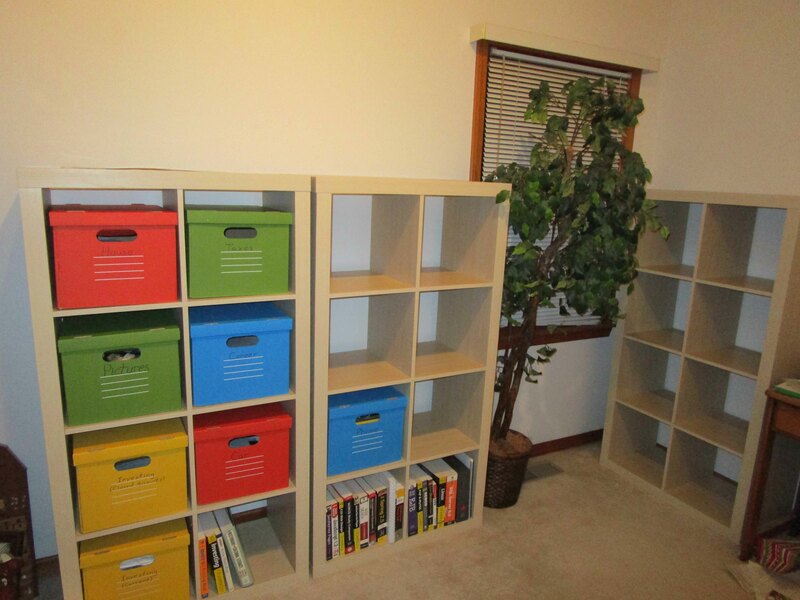 Once you have your stuff in labeled boxes, you can move all of the boxes to your "office" room where you can either stack them or put them on sturdy shelves. Be sure to keep important documents, pictures, and electronics up high and away from lower floors to protect against flood damage. Digital Media (Used): containing important data, pictures, etc... Make sure each of the following is (1) labeled appropriately, (2) is put in a protective case, (3) has off-site backups in case of fire. Keep media labeling markers / pens in same location. Write a description of the contents of each on an empty envelope, then put the media into the envelope. Receipts for gifts that you have purchased for other people kept together in a binder clip. Old Christmas and birthday cards can be cut on the fold and the top part used as added decoration on future gifts that you wrap. Within your "Health" folder on your computer, create a document called "health.doc" (click to download sample) in which you keep track of health information for each family member including doctor, dentist, and vision appointments, health status, health history, hospitalizations, and vaccinations. A collection of receipts for out-of-pocket medical expenses (see Qualified Medical Expenses) paid so you can reimburse yourself at the end of the year using your Health Savings Account (HSA). Lab test results, Blood test results. Image files from X-Rays, CAT Scans, MRI Scans on film, CD or DVD. Your health expense information can be used to determine health savings account reimbursements and for tax deductions. Proposals from contractors for labor and/or materials for repairs or work to be done on the house. In your "House" box, put a jar with a lid to hold all the various keys that you find around the house. It is important to know how much you have invested, where you are invested, how those investments are performing, and what is the risk and diversity of those investments. Keep the type and amounts of all your current accounts and investments organized on a single budget document. Information about obsolete closed accounts should be moved to a separate "Closed Accounts" document. In a separate "Investments (Closed Accounts)" box, put any historical information and documents related to obsolete closed accounts. Discard all old prospectuses. Copy of your will, codicils, trusts, and estates. Copy of your parent's wills, codicils, and trusts. Financial/healthcare power of attorney documents. Adoption, guardianship, immigration, and name-change documents. Tape receipts to product box when first using the item in case it needs to be returned. Credit Reports and information used to apply a Credit Freeze (or Security Freeze) to your credit reports. The following can be grouped by a binder clip in your "Money" box and discarded as soon as you have reconciled them with your checking account statement. If you have online banking you can reconcile receipts and transactions at almost any time. Cash receipts for consumable items can often be reconciled and discarded at the point of sale. Most items cannot be returned or exchanged after 90 days, so receipts for items such as clothes can be discarded after 90 days. Receipts for durable items (large and small appliances, electronics, cookware, ...) can be stapled inside the owner's manual or warranty card in your "Manuals" box and should be kept for at least the time covered by the product warranty. Receipts for gifts can be grouped by a binder clip and kept in your "Gifts" box in case a return or exchange is needed. Copy all photos from loose SD Cards to a folder within your "\Pictures" folder. Then, put each loose SD Card in a separate envelope with the current contents written on the front of the envelope. In your "Shopping" box, keep brochures. In the "Shopping" folder on your computer, keep all your shopping notes and product research. Make travel easier and less stressful by keeping all the items that you use each time you travel in a single location including a ready-to-go and always-packed suitcase and carry-on travel bag with as many travel essentials and packing list items as you can assemble. Any past travel notes, artifacts, itineraries, and documents that you wish to keep from previous trips grouped by binder clips for each trip. Travel guides and maps. Discard any guide books older than 7 years. Blank video tapes, video DVD's, micro video tapes marked "Blank"
A big part of staying organized is naming things correctly. So use accurate and meaning names for all your files including MS Word documents, MS Excel spreadsheets, Text files, Digital photos, PDF's, Bookmarks, and all other files. The file date-time stamp can often be a great way to determine when each picture was taken. Once you have established your folders for organizing computer files, put your files into those folders and not into "miscellaneous" locations such as on your desktop area. A file management utility like (Beyond Compare and many others) can be helpful for selectively backing up files to your backup media. Online Backup: Once you've put your important files in one place, backing up using an offsite online backup service should be relatively easy. See this review of backup services, PC Magazine. Never trust a hard disk drive! Always have external backups. your thousands of digital family photographs on thumb (flash) drives, external USB drives, burned DVD's, or burned CD's. Put each loose flash drive and jump drive in a separate envelope with the current contents written on the front of the envelope. ** Warning: The contents of safety deposit boxes are NOT insured by the bank nor by FDIC against fire, flood, or theft. Keep this document in a secure location and have a backup copy in a secure location. Maintain a similar (but separate) document for your work-related accounts at the office where you work. Unsubscribe from email lists that are not helpful to you. Take a moment and count the frequency of emails from various sources. You will be shocked to see that some advertisers are sending you emails every single day and even multiple times per day. Some companies will put you on multiple internal email lists and force you to unsubscribe from each one. Just because you make an online purchase from a company does NOT give them the right to send you emails for the rest of your life! Don't let them. Unsubscribe from any recruiter emails that are not aligned with your interests. Adjust your profile with social media web sites, so they don't send you emails that you don't need. Phone app notifications are often a better choice. Don't let people that you don't know waste your time by sending you emails and spam that you don't want and don't need. Try not to surrender your email address on those $1000-chance-to-win giveaways, these are marketing traps. Watch out for the pre-checked checkbox that says "OK to email me 3rd party promotions and newsletters" when making internet purchases. Change your email address to one that is not easy for spammers to automatically guess. Treat email as temporary (not permanent) storage. Many email systems automatically delete emails older emails, important information needs to be transferred to external documents. Obtain permission and instructions from your company to be able to access your work email on your cell phone so you can send and receive work emails and access your work calendar anytime. I recommend disabling email sound notifications. Each time you send or reply to an email, make sure the subject line accurately describes the topic being discussed. Clean things up using the Cleaning To-Do's as a guide. Countertops should be empty except for items that you use every day. Keep all clothes in closets, walk-in closets, dressers, and armoirs. Hang shirts, pants, and dresses on hangers to keep them clean, organized, and wrinkle-free. Use thick hangers to avoid damaging clothes. Replacing single closet rods with double-decker closet rods can help with having enough closet space. Put shirts and pants that you intend to wear again on hangers, so you can keep them wrinkle-free and separate from items that need to be washed. formalwear (ties, suits, keep coordinated suit jackets and suit pants together, (sweater) vests, cocktail/party/sweater dresses). Grouping your dry-clean-only items together can be helpful. Sweaters should be folded and put into a chest, drawer, or armoire to keep them free of dust. swimwear (suit, googles, sun hat, beachtowel). shoes can be put in a shoe cabinet or shoe bench. Avoid buying outfits that you don't wear. Before purchasing any outfit, try it on and make SURE that it is exactly what you want. Items put inside curio, china, and corner cabinets that have glass sides and glass doors rarely need dusting. Install a paper towl holder in the Garage. Place bottle of sanitizer beside it. A box of baby wipes can help with cleaning your feet before entering the house after being in the yard. Take an inventory of the rooms, closets, drawers, cabinets, shelves, and boxes in your house, and identify whether each one is used effectively. If they are not being used effectively, then they should be "repurposed". Try to rethink how the room, closet, drawer, cabinet, or shelf could be better used and then make it happen. Proper storage is not "hiding" items, it is knowing exactly where they are. A great question to ask yourself is: "By using storage effectively, can I reduce the number of items that are visible in my house by half and still know where absolutely everything is." To decide what to put into each drawer or cabinet, simply minimize the distance between where an item is used to where it is stored. If an item is used more than 8 feet away from where it is currently stored, then it is probably needs to be moved to a closer and more convenient drawer or cabinet. Take into consideration who in your family actually uses each item when deciding where to put or store each item. Don't use up storage storing items that are NEVER used. NEVER-used items should be recycled, donated, given away (to friends, relatives, kids, etc...), or thrown away. Organize shelves so that most used items are in front or on convenient shelves and least used items are in back or on high shelves. Organize items so that all items are visible. Move things that you use frequently into the most convenient cabinets, and move things you use rarely to the least convenient cabinets. Any storage area (drawer, cabinet, room, etc...) that is never touched and never accessed is not working and should be repurposed. Don't be afraid to open rooms, closets, drawers, cabinets, or boxes because they are full or messy. Go through them and you will find (1) valuable things that have gone missing, and (2) stuff that needs to be recycled. Just because a room, closet, drawer, cabinet, or box is "full" does not mean it is useful. If the contents of rooms, closets, drawers, cabinets, or boxes are absolutely never used, then perhaps the contents should be recycled, donated, given away (to friends, relatives, kids, etc...), or thrown away. As mentioned previously, take each item and move it to a different location. Then your mind will be forced to re-evaluate each item based on its actual significance rather than by "it's always been there". Food Pantry: reserve bottled water, soup cans, dried goods, unopened condiments. Refrigerator organized so food items (esp. the most parishable) are in front and easily visible so they won't become stale and forgotten. Write current date on any food items (such as restaurant styrofoam take-out containers) that are not already marked with an expiration date. Put long-term storage blankets, sweaters, clothing, and bedding items inside sturdy clear plastic zippered storage bags. Make sure your primary workspaces and activities areas are useful for their intended purpose and don't get "corrupted" and become places for piling junk. If items are not used very often, then put them into a storage cabinet and don't put them on a table or countertop. Kitchen counters are important workspaces for food preparation, not a place for junk. Kitchen and dining room tables should be used for eating with your family, not as places for junk. Coffee tables are a place for your guests to place a drink, not a place for junk. Dressers and vanities are workspaces to prepare for the day, not a place for junk. Only put things used every day on bathroom vanity counter tops, other things can be put in drawers. Office room desks are important workspaces for processing paperwork and computer work, not places for junk. Nightstands are your bedtime workspace (clock, book, light, coaster), not a place for junk. Vacuums, ironing boards, cleaning buckets, brooms, and dust pans should be put away when not in use. Garage workbenches are important workspace for projects, not places for junk. Billiard and ping pong tables are for these activities, not places for junk. Holiday (Christmas, Easter, Valentines, Halloween, etc...) decorations, ornaments, centerpieces, door decorations, costumes, dinnerware, and lights should be displayed during the holiday and put in storage during the rest of the year. Holiday decorations should stored in large labeled plastic bins with tight lids in a central location. Put all of your favorite channels on paper and tape it to the back of your remote. Keep your DVD library centralized and alphabetized by title. Keep your CD music library centralized and on a shelf alphabetized by artist last name. Your labeled boxes for storing documents. Move clothes hangers not currently being used to the laundry room near the dryer.